One of the world’s leading photographers, Edinburgh-born Albert Watson, will today (Wednesday 1 December) unveil his latest works of art, undertaken in partnership with The Macallan single malt whisky. Following the brand’s debut partnership with Scots-born photographer Rankin, The Macallan Masters of Photography: Albert Watson Edition continues the celebration of two very different but highly revered art processes, photography and whisky-making. Interpreting the story of The Macallan’s exceptional oak casks, Watson has visually documented his journey which began in the forests of Spain and ended at The Macallan’s spiritual home in Speyside. 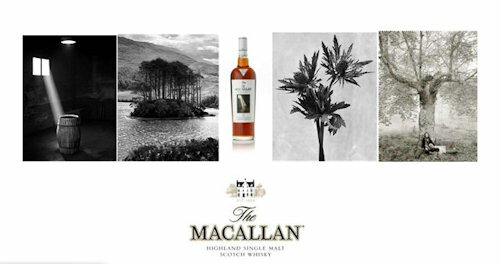 From 1 December 2010, the limited collection of 1,000 unique The Macallan Sherry Oak 20 year old bottles will be available for purchase throughout the world, each with a specially commissioned label by Watson and a set of 10 portfolio prints unique to this edition. A further 36 individually customised bottles of The Macallan 1946 whisky, the date Watson first met his wife Elizabeth, with a signed one-off collectible platinum print can also be purchased, once they have completed their world exhibition tour, with a reserve price of £10,000. To mark the launch, Watson’s photographic prints will be unveiled in London, kicking off a global exhibition tour. This unique collaboration with Albert Watson, winner of the prestigious Royal Photographic Society’s 2010 Centenary Medal, involves a bottle of The Macallan Sherry Oak 20 year old with a hand-signed portfolio and The Macallan’s exceptional 1946 whisky with a one off platinum print. The partnership began when Watson was invited by The Macallan to weave a visual narrative of the long journey made from acorn to glass to eventually produce a rich and complex Single Malt. here the mighty Spanish oaks grow, to the traditional cooperage in Jerez, Watson began a journey of discovery, culminating in the alchemy and passion of The Macallan Distillery in Scotland. The photographic odyssey took place in 3 parts, the romantic tale of a couple’s road trip, a series of images expanding on this particular journey and finally the creation of fine art platinum prints. Hand printed by one of the world’s leading fine art printers, platinum prints when compared to black and white silver prints, exhibit an expanded tonal range, three-dimensionality, and a uniquely luminous quality. They are also among the most permanent objects produced by man. The platinum metals are more stable than gold, and a platinum image, properly preserved, can last thousands of years. Ken Grier, Director of Malts, The Edrington Group said: “This project shows further development of the highly successful Masters of Photography franchise and brings us together with one of the greatest photographers of our time. The exceptional oak casks are at the heart of The Macallan’s fame, providing 60% of the distinctive flavour of The Macallan. They are the leading users of these sherry seasoned oak casks which are the most expensive and highly prized in the Scotch whisky industry. The casks are made from the rich timber grown in the forests of Northern Spain which are then hand-crafted at the cooperage in Jerez, before being seasoned with dry Oloroso sherry and shipped to Scotland to be filled with new make spirit at the Macallan Distillery on Speyside.